The global smart home healthcare market is predicted to grow at 33.0% CAGR during the forecast period with the market size reaching USD 35.6 billion by 2024. Different technologies such as wireless communication, a cellular network, and others as are majorly contributing to the smart home healthcare market size. 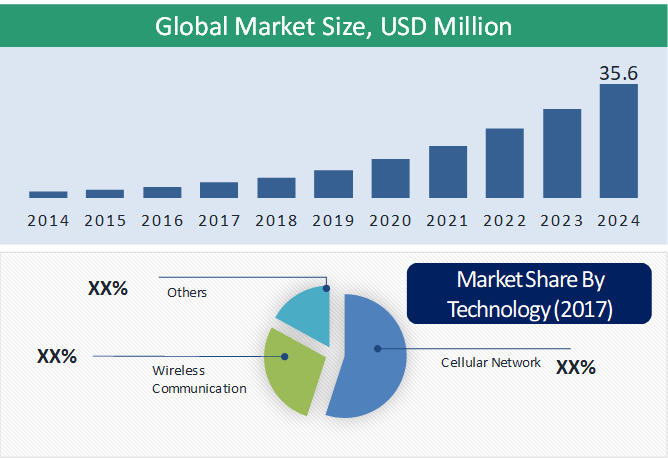 The market has witnessed significant demand for the cellular network over the last few years due to its easy approachability by consumers and easiness of usage. Smart home healthcare is designed to help in treatment diagnosis, care in the home. It helps in improving the communication between the caregivers and healthcare providers. Moreover, many health conditions, especially chronic diseases, could be monitored and treated in a home equipped with necessary smart home products. Based on technology, the smart home healthcare market is classified into wireless communication, a cellular network, and others, of which cellular network hold the largest share in the smart home healthcare market, globally. Easy approachability by consumers and easiness of usage led to the fastest growth of the cellular network segment during the historical period, which is also predicted to continue during the forecast period. On the basis of the service, the smart home healthcare market is segmented into installation and repair, and customization and renovation. Of all, the installation and repair category is predicted to witness the highest CAGR of during the forecast period and accounted the largest share in the smart home healthcare market due. On the basis of the application, the market is segmented into safety and security monitoring, memory aids, nutrition or diet monitoring, fall prevention and detection, health status monitoring and others. Of all, the smart home healthcare market size for fall prevention and detection is expected to grow at the fastest rate during the forecast period, globally, and accounted for the largest share of the market. The mounting demand for personalized healthcare, expanding demand for progressive smart home healthcare technologies, and escalating demand for mHealth technologies are the key factors leading to the growth in the smart home healthcare market, globally. Owing to the mounting demand of personalized healthcare and escalating demand for advanced smart home healthcare has resulted in increased demand of mHealth technologies and internet of things based monitoring systems, which further improve communication between patient and healthcare providers. Some of the other key factors driving the growth of the industry are expanding the geriatric population, escalating adoption of cloud technology in healthcare, and mounting disposable income. For instance, according to the World Health Organization (WHO), globally in 2010 approximately 524 million people were aged 65 years and older and is expected to reach 1.5 billion in 2050. Key factors hindering the growth of the smart home healthcare market are the data safety and security issues, elevated capital expenditure and maintenance requirement, and limited awareness of smart home healthcare technologies in developing countries. In addition, the dearth of skilled professionals is also having a negative impact on the growth of the market. Geographically, North America is the largest smart home healthcare market as the region the geriatric population is increasing. For instance, according to the U.S. Census Bureau, in 2012 approximately 43.1 million people were aged 65 years and older in the U.S. and is expected to reach 83.7 million in 2050. In addition, enhanced healthcare infrastructure, the mounting occurrence of chronic and lifestyle associated diseases, augmented alertness about inventive and advanced applications of smart home healthcare technologies and escalating healthcare spending is also fueling the growth of the North American smart home healthcare market. For instance, according to the Centers for Disease Control and Prevention (CDC) in 2012, approximately 117 million people in the U.S. had one or the more chronic conditions. Asia-Pacific is observed to witness significant growth in the smart home healthcare market during the forecast period, as the region comprises of a large population, and upsurge IT investments in the healthcare industry. 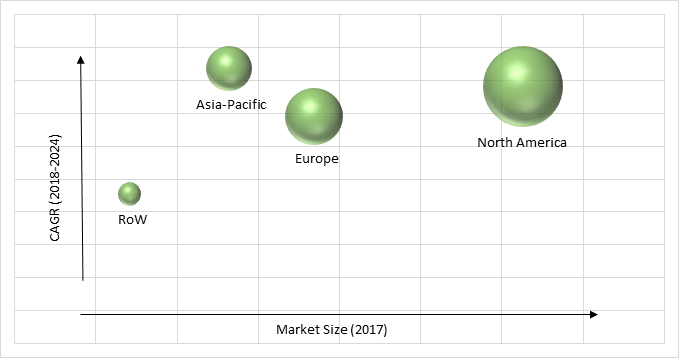 Moreover, expanding the geriatric population, escalating awareness about advanced and innovative applications of smart home-based wireless sensors and mounting occurrence of chronic and lifestyle associated diseases are also facilitating the significant growth of Asia-Pacific smart home healthcare industry. Market players in the smart home healthcare industry are investing capital to develop technologically advanced systems. In March 2018, Royal Philips partnered with Samsung Electronics Co. Ltd. to associate Samsung’s ARTIK IoT platform to the Philips HealthSuite Digital Platform. It allows to safely access and shares information with Philips’ cloud platform. Honeywell International Inc., Schneider Electric SE., Qualcomm Incorporated, Siemens AG, General Electric Company, Koninklijke Philips N.V, AT&T Inc., and Medical Guardian LLC are some of the key players offering solutions for smart home healthcare. Note: Financial insight is subject to availability of information in the secondary domain. Table 169 Snapshot – Koninklijke Philips N.V.
Table 170 Snapshot – AT&T Inc.